Goldfish plants earned their name because of their masses of red-orange flowers that appear in the spring and summer and look a bit like leaping goldfish. If you've ever seen a fully mature plant in a hanging basket in full bloom, it's a wonderful sight. They are profuse bloomers when cared for and add splashes of color. Indoors, these are great cascading plants for a bright sill or can be used in baskets. They are relatively long-lived plants, surviving almost a decade, providing you repot them when necessary (but not too often!) and keep them away from the air that is too dry or cold. The original plant has been extensively hybridized, so pick a plant based on its vigor and flower color. Goldfish plants are highly rewarding plants. Outdoors, they want to grow to 3 feet, but it's a good idea to pinch off the new stems and maintain the plant under 2 feet tall. This will encourage better blooming and bushiness. Older, larger stems will cascade down the side of the pot and form a really beautiful display when they flower, especially in hanging baskets. These plants are somewhat sensitive to high temperatures and moisture on their leaves, so if you start to see browning or leaf-drop, it could be that the temperatures are too high or the leaves are getting wet. Also look out for aphids, spider mites, and mealybugs as these are common pests on this tropical plant. Other problems can be attributed to poor daily care. Some signs of problems are leggy growth, leaf drop, and lack of flowering. For a plant that needs a humid environment, overwatering is often the culprit. The plants are also prone to mold and fungus growth. Careful inspection of the plants should be part of your routine care, which can help stop problems before they become intensified. Goldfish plants prefer bright light, but don't like direct light. An eastern facing window is perfect. They can also successfully be grown under lights indoors, especially during the winter. A light, the fast-draining potting soil is perfect. You can use fortified soils. In the wild, goldfish plants are epiphytes, a type of plant that grows upon other plants. It will usually grow on a tree. During the summer, water generously and keep the soil continuously moist. In the winter, cut back on the water and allow the soil to become slightly drier. This seems to encourage better blooming. Be aware that the soil should never dry completely out. Many people assume that tropical plants need high heat and high humidity to thrive. In nature, most of the tropical plants grow under a lush, green canopy of other plants, so the temperature is actually cooler. Goldfish houseplants are best in room temperatures of 65 to 75 degrees Fahrenheit. They need mild to moderate humidity and can be misted daily with room temperature water. Cold water will damage the foliage. In particularly dry environments, a humidifier near the plant is helpful. Feed weekly during the growing season with a weak liquid fertilizer that includes micronutrients and encourages blooming. Controlled release fertilizer pellets are also excellent. 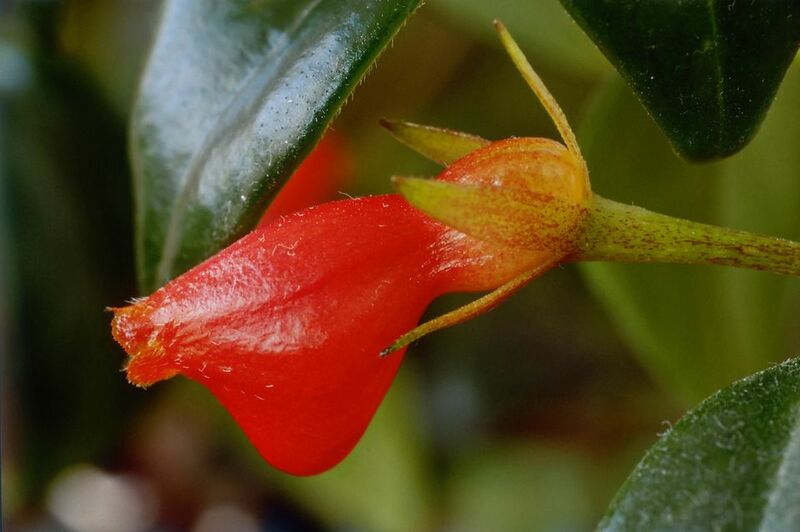 Like many tropical plants, goldfish plants like to be slightly pot-bound and seem to respond with greater vigor and better shows of flowers. As a result, only repot the plant every 2 to 3 years. When you repot, you can gently root-prune the parent plant to encourage new root growth. Don't repot into much larger pots, but limit the repotting to one size up. These will readily root from stem-tip cuttings. Choose stem tips that don't have flower buds on them and are about 2 to 3 inches long. A rooting hormone will increase your odds of success. Place newly planted cuttings in a warm, bright area and keep it humid until new growth emerges. New plants will not flower until the summer after they are propagated. Growers have done significant work with the basic breed and produced a variety of flower colors and even leaf forms. These plants are cousins to the African violet, and some of them have the same fuzzy leaves. As with African violets, try to avoid watering the leaves directly to avoid fungal problems. Varieties have red or yellow flowers, and the 'Fire Light' variety has lovely variegated leaves.